100% of your cat's daily needs. Vitamins D & E. Balanced minerals. Source of omega 6. Irresistible meals for mischief makers. No added artificial colourants, flavourings or preservatives. 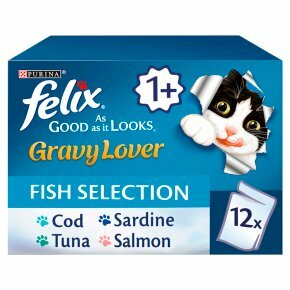 Once a Felix cat from the tasty first time... Felix Kitten food has the right combination of proteins, essential minerals and vitamins that little Felix's need to grow into big Felix's. Perfect fuel for the first years adventures! Feeding guide: For an average adult cat (4kg), 3 pouches per day in at least 2 separate meals Serve at room temperature. Clean, fresh drinking water should always be available. The adult maintenance averages are based on moderately active cats at normal environmental temperatures. Individual needs vary and feeding should be adjusted as required to maintain your cat at a lean, healthy body weight.